In Houston, it’s all but guaranteed that your parties will end up in the kitchen — so why not give them something to really talk about? 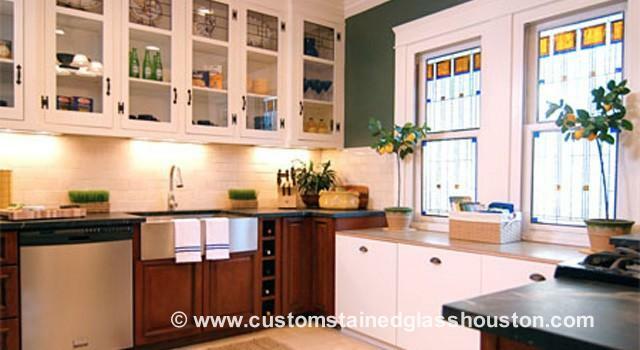 Stained glass kitchen windows or stained glass cabinets are more than just fabulous conversation starters. They add value and true distinctiveness to your kitchen, along with a warm inviting glow as the sun comes through or hits their beautiful prisms and colors. Many people don’t think of fine or valuable art for the kitchen, but with stained glass, that’s exactly what you are receiving. There are a lot of unique ways to add Houston stained glass to your kitchen. Although stained glass is popular for kitchen windows (and please check out our Gallery to see some beautiful examples) it also makes quite the style statement when added to the cabinet doors. If you would like to use your cabinets as a display case to show off fine china or objet d’art, you can use textured or beveled stained glass without color. And if you want to hide the contents, or add a gorgeous jolt of color to the kitchen, then our intricate colored stained glass designs will be just what you are looking for. Do you have a pantry, or door to a wine cellar? How about a stained glass panel with vineyard or grapevine design? Whatever the style of your Houston kitchen, stained glass can be designed to show it off to its best advantage. Our local Texas stained glass artists can design everything from Celtic designs, Art Nouveau designs, Frank Lloyd Wright inspired designs, to modern, contemporary designs. We wouldn’t be surprised, if after installing your Houston stained glass, (which is quick and easy, by the way) you’ll be throwing a party just to show it off to friends and family. 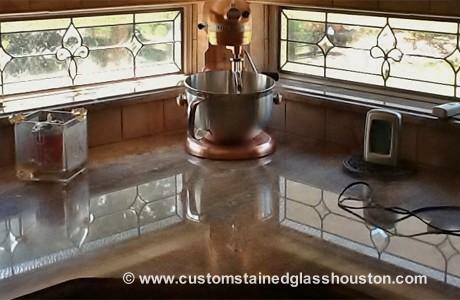 For Houston homes, stained glass provides beauty and practicality. What could be better? Although stained glass adds beauty to your home, it can also have another benefit that many homeowners have never considered. In many Houston neighborhoods, the kitchen windows look right into a neighbor’s home, or give you an up-close and personal view of their vinyl siding. Neither is very appealing. If the view outside is less than superb, adding Scottish Stained Glass can give you the privacy you would like or block the offending view, all the while letting the sunshine in. Do you have transom windows in your kitchen? Those are the small glass panels resting above the main kitchen windows. This is another popular place to add stained glass. Since these transom windows are small, they provide the perfect opportunity to enhance your kitchen without a major investment. However, we think you will be surprised and delighted at how affordable our custom stained glass can be. By the way, installation is always included with the price. Scottish Stained Glass is the largest stained glass studio in the country, using local artisans to create your panels whenever possible. We are proud to employ so many artists who are dedicated to keeping the stained glass tradition alive. Please contact us with your ideas for your kitchen stained glass. Or schedule a consultation with one of our local designers, to find out which style and type of leaded glass would meet your needs.